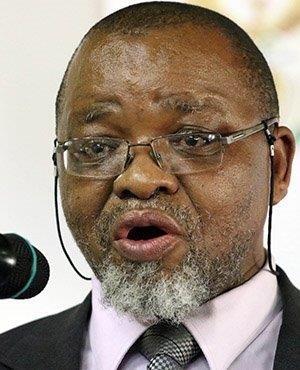 Mineral Resources Minister Gwede Mantashe has revealed that he objected to a proposal of using the mining industry as one of the mechanisms to fund the country's mooted sovereign wealth fund. Mantashe said the idea was raised in the ruling party circles in the late stages of the drafting of the Mining Charter. "There was a discussion about creating a sovereign wealth fund, which is a good concept. It works everywhere in the world where there are resources, whether it is mining, oil or gas,” Mantashe told leaders of the mining industry during his address at the Joburg Indaba. “I said to them 'you cannot milk the industry which is already on its knees',” he told delegates. Mantashe, who became Minister in February stressed the importance of transformation as outlined in the charter which was gazetted last month. He stressed that for the industry to be competitive, it has to be transformed and that companies must not see transformation as a requirement only needed to tick the BEE score card. Talk of setting up a sovereign wealth fund gained momentum this year, with the ANC proposing during its legotla in July that the fund must be established before the start of the next term of government. According to a report by City Press, the ANC Legotla proposed that a sovereign wealth fund would enable government “to provide a steady resource for national development objectives”. However, the country’s stagnant economy, which slipped into recession this year after the gross domestic product (GDP) declined 0.7% in the second quarter, might put brakes on the ruling party's ambitious plan. Key economic indicators, including investor confidence, has also been declining. Last month, government announced a R50bn economic stimulus in a bid to boost recovery and stimulate job creation. Only six African countries, namely Angola, Nigeria, Libya, Rwanda, Botswana and Morocco, are part of the International Forum of Sovereign Wealth Funds. Mantashe urged bosses of the mining industry to refrain from talking down the sector, adding that he was still confident the industry was a critical player in boosting the economy.